Porsche Design P'8613 - Matte Black Need Help? Porsche Design since its inception has been renowned for both innovation and luxury. A perfect example is the latest icon to join their ranks, we present the P’8613 sunglasses. The P'8613 aviator is a unisex design, that comes with two sets of interchangeable lenses that are easily switched in and out in seconds. One set that is rimmed in acetate and one standard - providing two distinct looks. Handmade in Japan and made of ultra-light ultra-strong Titanium, nothing was spared in their meticulous construction. 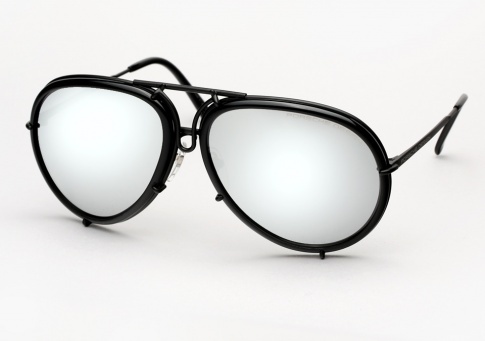 It is available here in a matte black frame with black rimmed silver mirror lenses + brown lenses.